Contemporary frame with a bright silver non-tarnish border which surrounds black glass. The glass can be reverse engraved with a laser to create a special and unique gift. We engrave with the word FAMILY and the two side decorations. 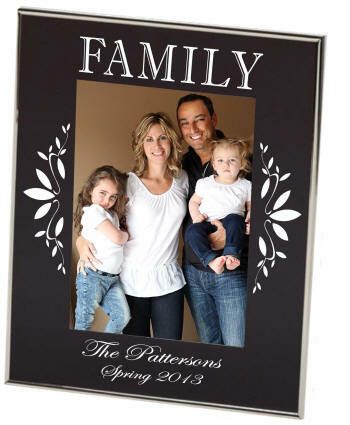 Add personalization to your specifications at the bottom of the frame. The glass is reverse etched to give an elegant and stunning presentation to your photograph. Holds a 4x6 or 5x7 photo and has a black flocked channel back. White Gift Box. Frame will be engraved as shown, except for the personalization which should be entered in the available text box.